When you get The Trails Collection on top of your existing Thousand Trails membership, you'll discover additional locations including Encore RV Resorts, with properties in prime sunbelt destinations. Plus, you'll enjoy many more top campgrounds throughout the country. Get The Trails Collection today and start exploring now. 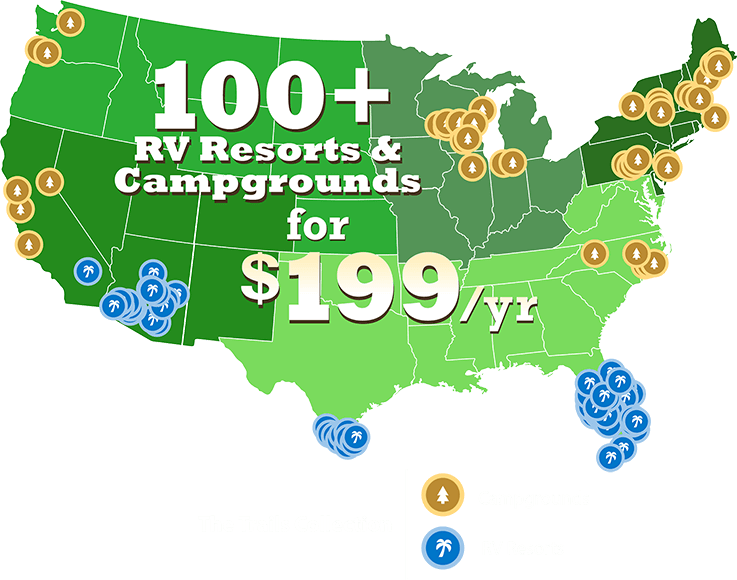 $199 only good until Thousand Trails Camping Pass renewal is due, then $199 for a full year. Ready to learn more about The Trails Collection? Copyright © 2019 Equity LifeStyle Properties, All Rights Reserved. What is The Trails Collection Reciprocal Program? The Trails Collection Reciprocal Program (the “Program”) allows participating Thousand Trails members to use campsites and other facilities at the campgrounds and Encore RV resorts affiliated with the Program. Thousand Trails Members who enter into an agreement to participate in the Program are referred to herein as “you” or “your”. Who Operates The Trails Collection Reciprocal Program? The Program is operated by Encore Royalty Club, L.L.C., doing business as The Trails Collection (“we”, “us”, or “our”). We are an independent company and have made arrangements for members of the Program to use the campgrounds and Encore RV resorts affiliated with the Program through agreements with the owners of the resorts. How can I find out which resorts are included in The Trails Collection Reciprocal Program? 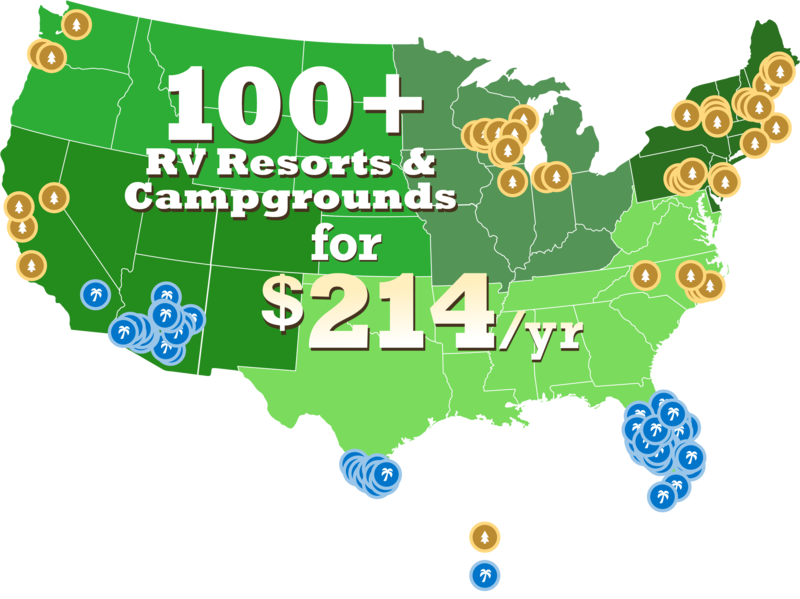 A list of the campgrounds and Encore RV resorts currently affiliated with the Program is on the internet at www.thetrailscollection.com (the “Affiliated Resorts”). Is membership in The Trails Collection Reciprocal Program part of my Thousand Trails membership? No. Your application and agreement for membership in the Program is a separate and distinct contract from your Thousand Trails membership agreement. However, to participate in the Program, you must maintain your Thousand Trails membership agreement in good standing and remain current in all payments required by your Thousand Trails membership agreement. Do the Thousand Trails Member Rules apply to my stay at an Affiliated Resort? No. The Program has its own Member Rules that apply to your stay at an Affiliated Resort. In addition, you must comply with the rules and regulations of the Affiliated Resort during your stay at that resort. Can anyone purchase membership in The Trails Collection Reciprocal Program as a separate product? No. Only existing Thousand Trails members in good standing are eligible to become members of Program. Can a resort be removed from The Trails Collection Reciprocal Program? Yes. We reserve the right to withdraw any Affiliated Resort from the Program at any time and we do not guarantee that any particular Affiliated Resort will always be affiliated with the Program. What is the initial term of my membership in The Trails Collection Reciprocal Program? The initial term of your membership in the Program will begin on the date of purchase and continue until the next anniversary of the date of purchase of your Thousand Trails membership agreement (“your Anniversary Date”). How much does membership in the Program cost? The dues for membership in the Program are currently $199 per year or portion thereof. You will be charged $199 for the partial year that begins on the date of purchase and ends on your next Anniversary Date (i.e., the $199 will not be prorated for this initial partial year). The amount of these dues is subject to increase, in our sole discretion. If you choose to let your membership in the Program lapse by not paying dues within 90 days of any renewal date, you will be charged a $150.00 reinstatement fee in addition to the current amount of dues. Can I purchase membership in the Program for one year and remove it for the next billing year? Yes, you can add or drop your membership in the Program each billing year as long as the Program is available and you make your request in a timely manner. Once I am a member of The Trails Collection Reciprocal Program, will my membership in the Program auto- renew each year? Yes, your membership in the Program will automatically renew each year unless you cancel your membership in the Program or we cancel your membership. Will there be any additional costs associated with staying at an Affiliated Resort? Certain of the Affiliated Resorts are designated as “Fee Resorts” and certain of the Affiliated Resorts are designated as “Non-Fee Resorts”, as noted on our website. A fee of $20 per night generally applies for use of a standard RV site at a Fee Resort and no charge for use of a standard RV site at a Non-Fee Resort. In addition, you generally pay a fee for premium RV sites and the prevailing market rate for rental accommodations at all Affiliated Resorts. The fee for premium RV sites and the rental rates for rental accommodations vary with the type of site or accommodation, the season and the location of the resort, and all fees are subject to change without notice. Will any additional fees apply, such as a per day resort fee? There will be no resort fees or other fees applied to a stay at an Affiliated Resort in the Program aside from the $20 per night fee that applies to the designated “Fee Resorts” and premium RV site fees. Am I assured a reservation at an Affiliated Resort in the Program? No. All reservations at the Affiliated Resorts depend upon the availability of RV sites or rental units, and requests can only be confirmed if space is available. Therefore, we do not guarantee that you will receive an RV site or rental unit at any particular resort. At all of the Affiliated Resorts only a limited number of RV campsites (approximately 10 at each resort) are available for use by members of the Program. What if I can’t get a reservation at the Affiliate Resort of my choice? We make every effort to utilize the available sites to the best of our ability; however, there may be occasions when we cannot accommodate everyone at a property. We will do our best to offer alternate dates and properties in an effort to accommodate members of the Program. Thousand Trails members are familiar with the first come, first served policy in effect at the Thousand Trails preserves. Will reservations at Affiliated Resorts in the Program be for designated sites? Yes, a specific site will be assigned at the time a reservation is confirmed, although the Affiliated Resort reserves the right to change the assigned site. As a member of the Program can I reserve a specific site or am I limited to sites designated for members of the Program? Members of the Program can request specific sites when they make their reservation online or through the call center. However, site requests are subject to availability and the Affiliated Resort reserves the right to change the assigned site. How quickly after my purchase of membership in the Program can I stay at an Affiliated Resort? Please allow 24 hours for your enrollment process to be completed and for your access to the Affiliated Resorts to commence. To expedite the enrollment process, please setup your Thousand Trails membership account to pay with a credit card or automatic withdrawal from a bank account. In the event you do not have a payment method on file, a Member Services representative will contact you for payment or you may call 888-579-7599. Our office hours are Monday-Friday 7 am -7 pm CST. Your membership will be activated after your payment is made. How far in advance can I make a reservation for a stay at an Affiliated Resort in the Program? You may make a reservation to stay at an Affiliated Resort 60 days in advance of your intended date of arrival. This advance reservation window may be different than the advance reservation window for your Thousand Trails membership. What are the usage rules for an Affiliated Resort in the Program? You may stay at one Affiliated Resort in a recreational vehicle up to 14 consecutive nights and in a tent up to seven consecutive nights. If you stay at any Affiliated Resort for more than four consecutive nights, you must wait seven nights before you can stay again at any Affiliated Resort. We may, at our sole discretion, limit the number of times you may stay at the same Affiliated Resort during the resort’s peak season. I spent a significant amount of money to upgrade and gain access to select Encore properties. Now you’re offering access to all the Encore resorts for just $199 per year? Your membership upgrade came with a number of valuable benefits and the upgrade did not increase your annual dues. Your upgrade features a longer advance booking window meaning you can book the Encore properties included in your Thousand Trails membership before members of the Program can book them. Your upgrade provides for longer stays at the Encore properties included in your Thousand Trails membership. Your upgrade gives you the ability to travel park-to-park. Membership in The Trails Collection is only valid for one year and is subject to renewal, and possible cost increases, annually. Does the new Program affect my access to the Encore properties that are currently part of my Thousand Trails membership? No. If you already have access to an Encore property or properties as part of your Thousand Trails membership, nothing will change. Your Thousand Trails membership contract will remain the same. There is no need to become a member of the Program to access an Encore property or properties that are part of your current Thousand Trails membership contract. If an Encore property or properties are currently part of my Thousand Trails membership, will the advance reservation window for my Thousand Trails membership apply? Yes. If you have an Encore property or properties included in your existing Thousand Trails membership, the advance reservation window in your Thousand Trails membership will apply when booking a reservation at these Encore properties. Can Family Courtesy Card holders use the Affiliated Resorts under the Primary member’s membership in the Program? Can Family Courtesy Card holders purchase membership in the Program? The dues for membership in the Program are currently $214 per year or portion thereof. You will be charged $214 for the partial year that begins on the date of purchase and ends on your next Anniversary Date (i.e., the $214 will not be prorated for this initial partial year). Can I go directly from a Thousand Trails preserve to an Affiliated Resort or directly from an Affiliated Resort to a Thousand Trails preserve? If you have a Thousand Trails Camping Pass that has not been upgraded to include park to park travel benefits, and you stay at an Affiliated Resort or stay for more than four nights at a Thousand Trails preserve, you must wait seven nights before visiting another Affiliated Resort or Thousand Trails preserve. If you have an upgraded Thousand Trails membership that allows park to park travel among Thousand Trails preserves without any waiting period between visits, you may go directly from an Affiliated Resort to a Thousand Trails preserve without waiting seven nights. Likewise, you may also go directly from a Thousand Trails preserve to an Affiliated Resort without waiting seven nights. However, we may, at our sole discretion, impose reasonable restrictions designed to prevent excessive use of properties in a close proximity to each other. I spent a significant amount of money to upgrade and gain access to select Encore properties. Now you’re offering access to all the Encore resorts for just $214 per year?